The Stage 3 Diesel Boost Coolers are the most comprehensive Lower EGTs 100-300 degrees and increase HP by 65+ with a cleaner, cooler running diesel! The Snow Performance POWER-MAX is available for all turbo diesel applications. 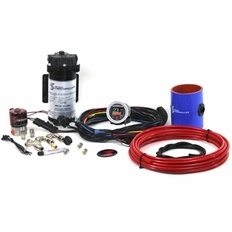 The POWER-MAX diesel water methanol injection kit uses a progressive controller that commands two stages of water-methanol that proportionally inject more or less according to boost pressure. Start and full points on the Powermax kit are adjustable for engagement and delivery curve to match what the engine requires. Proportionally injecting according to boost pressure gives an accurate delivery of water-methanol and allows cooling and performance improvements over a wide range for improved drivability. New for 2015, the POWER-MAX introduces the VC-50 Controller. The VC-50 offers the functionality of a boost gauge and water-methanol controller all in one! Highlighting a adjustable 7 color (Blue, White, Red, Yellow, Orange, Purple, Green) OLED screen displaying boost, percentage of injection, secondary nozzle activation, prime button, and 2 fault codes directly on the screen. The part number for this item is Snow Performance 440 and it fits 2014-2017 Dodge Ram 3.0 EcoDiesel Trucks.